Currently the G2 polyphonic voice allocation mode seems to be limited to only one - "rotate" - each new note triggers another available patch voice, even if the same note is played. There needs to be an option to select another voice allocation mode - "repeat" - that will retrigger the same poly voice if the same note is played. Some older synths use this repeat mode - like the SCI Prophet-5. The Oberheim OB-Mx has the ability for either voice allocation mode to be selected. Playing long evolving sounds, the retriggering shuts down the sound abrupt. I'm not in favor of such, in fact, I dislike it very much. So, what is the use of such a feature? Playing long evolving sounds, the retriggering shuts down the sound abrupt. I'm not in favor of such, in fact, I dislike it very much. So, what is the use of such a feature? This repeat mode becomes desirable only when there is something unique about each voice in the patch that you want to remain consistent while repeating the same notes. The most common thing I like the repeat mode for is when there are two or more oscillators per voice that are slightly detuned, slowly going in and out of phase. With the repeat mode, replaying the same note triggers the same voice and the phase change of the oscillators remains consistent. The current rotate mode will always assign a new voice even when the same note is played and each new voice will most likely be at a different part of the in/out phase cycle of the oscillators. This sounds disjointed and usually undesirable to me. The difference between the repeat and rotate mode is very noticable when playing arpeggios. 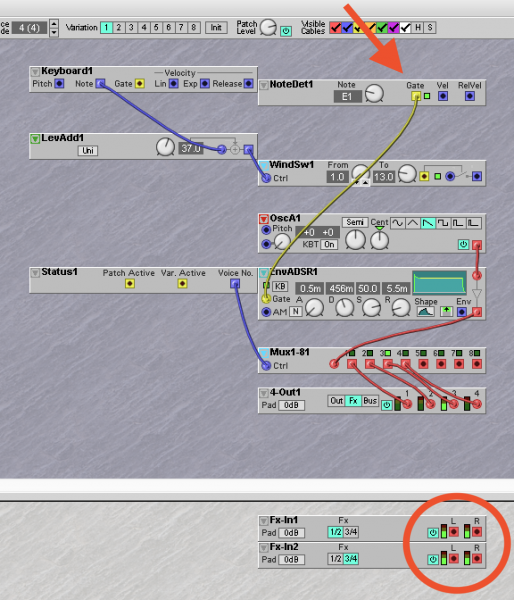 Slot A contains a lead patch set to 8 voices being played by a sequencer that playes 8 notes on each loop. Each voice in the patch has slightly detuned ocsillators and each voice is being randomly panned in stereo by a slowly changing signal. So, each time through the sequencer loop, each note retriggers the same patch voice. This sort of illustrates the effect of the repeat mode, except that this effect relies on the number of notes and voices instead of the note number. The intended effect fails if the voice count or notes per loop count is changed. This performance would act a bit differently if the Slot A patch could be set to repeat mode. The random note generator often has repeated notes in the 8 note sequence. If only three different notes happen to be set in the 8 note sequence, a repeat mode would only be triggering 3 voices! The Slot B bass patch has a similar voice allocation effect using 4 voices. Sorry for the long reply. I'm sure it took me longer to write this than it would take a Clavia software engineer to write the code for a repeat mode voice allocation function! In fact, the drawback pointed out by Wout is sometimes an advantage. "Repeat same voice" mode is very important for some types of patches and some types of playing styles. For example, if you are trying to synthesize anything that is played like a mandolin or a hammered dulcimer, with the same note getting played many times in rapid succession. Without this mode, whereby the same voice would be used over again on the same note, this playing style will quickly start robbing voices from any sustaining chord notes to play the repeated note, destroying any sustaining chords. And it's not just an issue with voice robbing. Any patch that is supposed to behave like a piano, a harp, or just about ANY real acoustic polyphonic instrument should have an option for this "repeat same voice' behavior. Otherwise, even if you had unlimited voices and voice robbing wasn't a problem, you still have the problem of the new repeating notes overlapping the releases of the old notes instead of shutting them off and starting again, which is a very unrealistic effect for these types of patches. For example, when you pluck the same string twice on a harp, you don't hear the first note continuing to decay layered under the new note, the new note stops the old note and you only hear one note at a time on any given pitch. Any polyphonic acoustic instruments that have any amount of natural volume release time will suffer from this unrealistic behavior when playing the same note in rapid succession while the old note is still decaying. I've mentioned this to Clavia a couple of times. along with some other wishlist ideas for additional voice allocation modes like Pitch Ordered (so that polyphonic portamento sounds musical, not just like pitches sliding from seemingly random starting points). I'm hoping some of this stuff will eventually make it into the G2. These are the kinds of things that can really add a lot to an instruments playability. I've also been checking the G2 voice behaviour, and did find out the G2 always round robin's the sequence, for as long as no same note is played right after the previous one. And with all patches with more than 1 voice, it always starts at "voice nr 2" no matter how many voices selected. but how does the G2 decides to leave the RR pattern, and starts alter(n)ating? Then I repeat one note a,A,b,c,d,a. This will kick in the alteration of the pattern on the voice allocation and will mess up the pattern. However, there seems to be no constant in WHEN the G2 decides to alterate the sequence.. it can happen after 4 rounds, 16, 24.. But then.. I make the note sequence: A,B,B,D and this makes the voices cycle: 1,2,2,4,1,3,3,4 constantly. A,B,C,D,D makes 2,3,1,1,2,3,4,4.Then A 3 voice patch gives 2,11,2,33 So the place in the sequence where the note is doubled dóes matter. then I also found, 9-10 times I get the alterated voice sequence be restored to 1,2,3,4 as soon as the repeated same note (which messed the sequence up in the 1st place) is repeated again.. and then quickly select another note for the double one before the next round, seems to do it. Last but not least, when setting the gate (value-)sequencer to all 1's, 2's etc makes the voice selection stop completely.. that makes only 1 voices get repeated, check Patch nr3. Or am I missing something? And it's not really 1 voice? I'm sorry I kept revising my post, bad habit of mine..
No, connecting the sequencer trigger output to the envelope will trigger all four voices to sound at the same time, not just one voice. Hi. I have a query about voice allocation so I thought I'd add to this thread rather than start a new one. I would like to play all the voices at once each time I press a new key, but I find that what happens is the G2 selects only one voice at a time. Is there an easy way to play all voices at once from the keyboard? 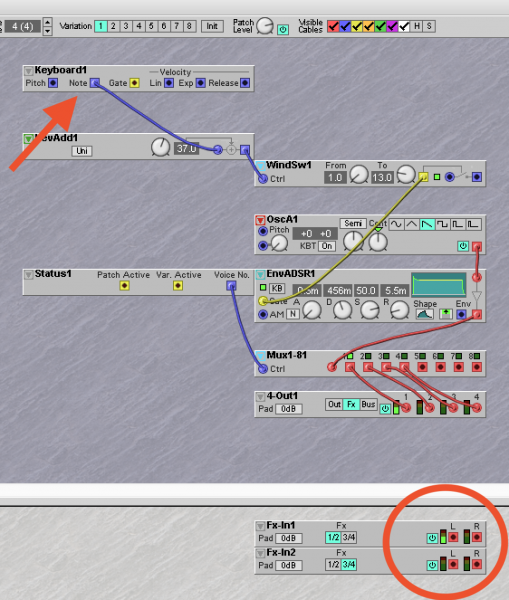 The Note Detect module works (as shown in the screenshot below) but obviously I can only play one note and I would like to be able to assign several notes to the oscillator & envelope. I do have a work around which involves routing the gate signals from another slot, but its not very elegant or cheap and I can only achieve six notes polyphony. Others solutions are available too (with more than six notes polyphony) if you can use other slots. I made a polyphony management building block some time ago, which allows for poly/mono/unisono voice activation. Maybe it's what you're looking for.